Olymbec USA now holds stake in the state of Nebraska! The most recent acquisition by Olymbec marks its first real estate footprint in the Cornhusker State - looking forward to more activity to come. Located at 4502 Maas Road, this two-story Class A office building was recently built with modern quality construction, and offers 85,563 SF of rentable space on 291,852 SF of land. This property is ideal for a company headquarters, as it hosts ample parking, state-of-the-art conference rooms and many more amenities fit for employers and employees. 4502 Maas Road remains active in the Omaha office market, and is ideally located in the city of Bellevue (southern suburb of Omaha, in Sarpy County) off of Highway 370, within close vicinity to Route 75, residences, golf courses, Twin Creek Plaza shopping mall, and the Offutt Air Force Base. Olymbec proudly continues its expansion in the Midwest to help with your leasing needs! Olymbec USA now holds stake in the state of Nebraska! The most recent acquisitionmarks its first real estate footprint in Nebraska. 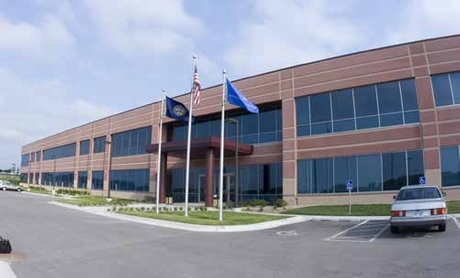 Located at 4502 Maass Road, this two-story Class A office building was recently built with modern quality construction. This property is ideal for a company headquarters, as it hosts ample parking, state-of-the-art conference rooms and many more amenities fit for employers and employees. It is ideally located in the city of Bellevue, off of Highway 370, within close vicinity to Route 75.